NEW ORLEANS – Under normal circumstances, this city runs to wild. In the lively French Quarter, street performers, musicians, adult entertainers and free-flowing alcohol entertain tourists from all over the world, around the clock and every day. Add to the mix both a Super Bowl and Mardi Gras at the same time to produce enough revelry to strain even the Big Easy’s partying capacity. Colin Kaepernick, San Francisco quarterback and Turlock’s hometown hero, was nowhere to be seen on Saturday, except for his giant promotional image on the side of a building overlooking a pregame festival and a possible sighting on a team bus rolling through town. That makes sense for players but the day before the Super Bowl couldn’t be more different for loud and rowdy fans, who filled the streets, shops, restaurants and bars. Football fanaticism has descended on this city to the loud tune of jazz. Bad news for San Francisco on that front: Baltimore is winning the ground game. Fans in purple Ravens jerseys far outnumber the red-clad Forty-Niners Faithful, which means they’re probably drinking more too. But the 49ers hold the edge in pregame confidence, according to a wildly unscientific street survey. Kaepernick plays a large role in that assessment. 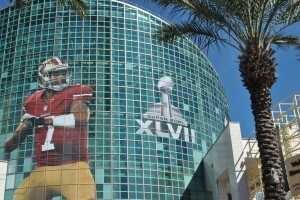 Football fans flooded New Orleans for the Super Bowl. “Kaep’s going to wipe the floor up with these guys,” foretold a San Francisco fan wearing a 49ers jersey with Kaepernick’s #7. “The Ravens were lucky to get this far. These teams don’t belong in the same league,” insisted another Niners fan, predicting a San Francisco blowout. How do Baltimore fans see the game? “We’re just glad to be here,” said one. 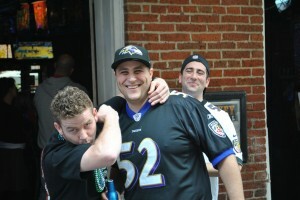 Niners fans like the sound of that, but can the Ravens win? Won’t anyone predict a Baltimore victory? 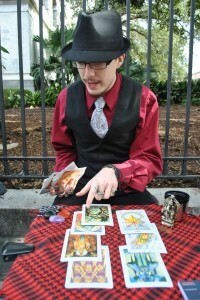 Jacob, a psychic, read an unclear future for the game. Clearly, an impartial source was needed so your reporter sat down with a card reader for another perspective. “I don’t know much about football,” admitted Jacob, who performs “metaphysical services,” but he agreed to the reading anyway. The gist was this: one team has an advantage in efficiency and speed, and the other faces the challenge of an emotional obstacle. Efficiency and speed hold the upper hand but Jacob couldn’t say with certainty which team that was, nor could he guarantee who would win. “They will determine their own future,” he said of the Super Bowl rivals. Speed could certainly refer to Kaepernick, but as for emotional obstacles, both teams had their public relations issues this week. San Francisco’s Chris Culliver ignited a firestorm of controversy with homophobic comments, for which he later apologized, and Baltimore’s Ray Lewis angrily denied charges of using performance enhancing drugs. Hoping for more certainty, I consulted a magician, who demonstrated his ability to make a coin appear and disappear. He said he could also cast a spell to sway the outcome of the game. “Can you guarantee the win?” I asked. “You can’t afford it,” he replied.